I mostly worked on Choreography today, which is a “thing,” but not one that’s ready to share yet! My students at the Craft Center had expressed interest in torch enameling, so today we conducted a little experiement with gasses. Both pieces are copper with Clear Flux on top. Check out the results! 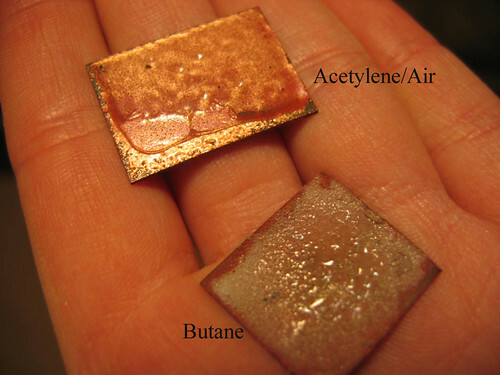 The Acetylene/Air definitely had more controlled results though the glass pulled away from the edge quite a bit, while the butane really oxidized the copper and completely changed the color of the enamel. I honestly didn’t the the butane would work at all, but it turned out interesting!